We live in an age of exaggeration, and these two wonderful words have been two of the victims. Let’s do what we can to bring a measure of reason and exactness to them. 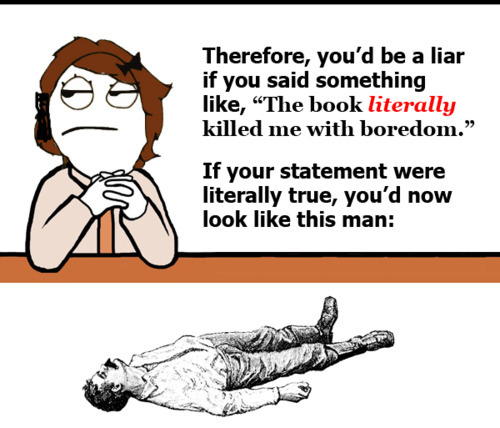 Literally means actually. Not like, not similar to, not as if, but actually. If something literally happened, then it really did happen in space and time. Figuratively means that something was like something else, that it was “as if” something were like something else, but in actuality, wasn’t. We use word to create a comparison. If something literally cost you an arm and a leg, that is both criminal and painful. If you say that it did, we should all know that you are speaking figuratively (we hope). If something literally blew you away, then you ended up, due to high winds or an explosion of some sort, in a difference place from where you began. If you were literally broke, that means that you have no money. Not a sou. Not a dime. Not a penny. What we need to do is gently and slowly bring back the word figuratively into our speech, or at least into our written expressions. Or better still, let’s simply drop the word literally from our speech and writing altogether, because most of the time, we mean figuratively anyway!